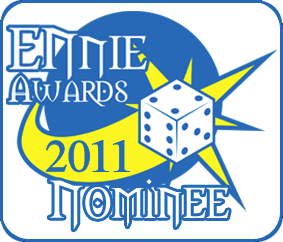 The Danse Macabre has been nominated for an Ennie award, and also received two honorable mentions. Congratulations to co-developer Chuck Wendig and the writing team of Benjamin Baugh, David Brookshaw, Christopher Cowger, Bethany Culp, Matthew McFarland, and Greg Stolze. Congratulations also to cover artist Michael Komarck and art director Craig S Grant. Thanks to everyone who made this book such a success. I couldn’t be prouder. Congratulations. I’ve gotten a lot of gaming mileage out of the book. Just a good good book. I’m really glad you’re enjoying it!